Jefferson County, WV who embarked on separate journeys into the world of our ancestors, leading us to each other and bringing us a fresh understanding of the community in which they lived. By discovering the intertwining roots of our families, under walls of division and lost history, treasured new relationships have blossomed. Please join us at Fishermans Hall on April 13th for a presentation of our individual and shared research. In each family story, there are brush strokes still needed to complete a full picture of our past. This will continue to enrich the vast scope of our shared history, difficult and inspiring, separate and together. So bring your questions and bring a friend! “Yes We Remember”- her family research in Honoring and keeping alive the memories of families that have paved the way for future generations. Also, how she connected with Monique and the Harewood plantation. Her books of family history. Her research on her Charles Town ancestors, including the Thompson family, who were enslaved at Claymont. Her book on the Thompsons. “Claymont’s Families: Research on the Enslaved Population of the Claymont (Court) Plantation.” Sarah is a descendant of Claymont’s slaveholders, the Bushrod Corbin Washington family. “Crossing the CountyLines.” A noted genealogist traces her family from Loudoun County VA to Jefferson County as freed people. Marsha has been researching her family’s history for over 20 years. Her maternal line has extensive connections to Jefferson and Berkeley County, West Virginia dating back to when both were part of Virginia. In recent years, she has incorporated using autosomal DNA to extend her family tree and connect to new cousins. Nikki is a life long resident of Martinsburg, WV. When she’s not researching, she busy teaching 7th and 8th grade English. Nikki has only been researching for a few years, but it has become a passion for her. Her goal is to become proficient at using DNA to pinpoint the location and names of her ancestors. A few days ago, I was on my back porch, and I noticed a lovely butterfly landing on one of the plants. Wow, I wonder if she’ll stay long enough for me to go get my camera?? I dashed into the house, and, of course, the camera wasn’t ready. I had to stop and put the SD card back in. Feeling a bit deflated because I was taking so long, I just knew that the beautiful butterfly would be long gone. But I headed back out to where I saw it and low and behold she was still there!! As I snapped picture after picture I talked gently to her. Black and beautiful as can be! She was just fluttering from plant to plant, then holding still at times and posing for me. I was so excited for I had heard that when butterflies come to you they are in fact your ancestors coming to say hello with a meaning we have to find. Then later that day I went out to get the mail and up from the small group of flowers at the base of the mailbox stand, came two pure white butterflies. They both flew all around me as I walked back up towards the house. I changed my mind and veered off the driveway towards my small vegetable garden to see what was growing. The White butterflies continued to fly around in front of me. I saw there were string beans and a large green tomato that I wanted to harvest, so I headed back towards the house to get a bowl. Those butterflies followed me right up to the front door. Of course (as usual), as I entered the houseI got distracted, I changed shoes and went into my office and sat down at the computer. 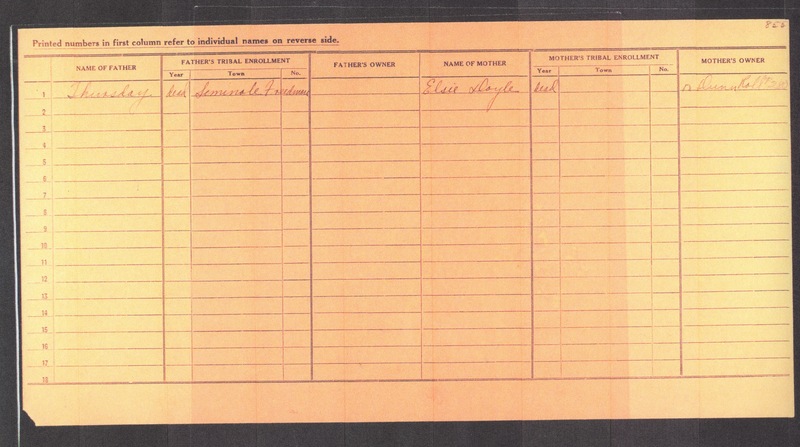 On top of papers directly under the computer screen; was a form from the Oklahoma Historical Society Research Center. My intention was to fill it out and request a copy of any records available for Polly Johnson, (paternal our great-grandmother). As I reached for a pen, I picked up the phone instead and called the number listed on the form. I spent almost an hour on the phone with a lovely young lady Katie, who guided my search through various links and what we found…well I just had to take a moment and breath….I didn’t realize until then that I had been holding my breath and gritting my teeth so hard my jaw began to ache. Finally, after getting my breathing under control, I said a prayer of thanks, both to God and to the Butterflies! These two images are Polly Johnson’s enrollment card as a Creek Freedmen qualifying her for payment of 40 acres we found. Sadly, though it states that Polly was not mentally well enough to speak for herself. Her cousin Sally Roberts gave witness on her behalf. The back of her card (to the right) list Polly’s father; “Thursday” listed as a Seminole Freedmen, and her mother Elsie Doyle a full blood Creek. Other records support her mother’s bloodline. Now I believe I understand why I couldn’t find our names on the rolls. Polly born 1845, was registered on the 1865 Dunn rolls before her first child was born, by the time the Dawes rolls were put in place (1906-1907) Polly had seen such hardship we hesitate to imagine. Her husband had died, left her penniless with five children, then her brother moved in as a widow, invalid and with two young daughters. As 1900 rolled in she was still struggling to make ends meet. Living with her extended family in a boarding house and washing clothes for 10-12 hours each day, seven days a week for so little pay. By 1903, Polly was in poor health, just plain worn out and with the help of Sally Roberts her cousin and other family members they moved her to Oklahoma nearer to her family. Her children were all grown and gone on to find their way in life, but she had her daughter Ida and many other family members to count on. Her oldest was John Grant Pegg, married to the former Mary Charlotte Page of Kansas, father, and a respected Republican in Omaha employed by the Mayor as the Weights and Measures Inspector. Her daughters Ida and Maggie both married and with families of their own. Not sure what happened to Robert but Bayless her second son by this time was up north with younger brother Charles homesteading on their cattle ranch in the Sandhills of Nebraska. They eventually gave up the harsh life and Charles first moved to Illinois then onto Oakland, CA and Bayless moved to Chicago, IL. Listed as a Freedmen was a mixed bag for many, it must have felt like being the ball in a ping-pong tournament First the mixed blood was accepted, and then the Five Tribes declared them noncitizens. This argument has continued to present day. Can the descendants of the mix blood and slaves of the Indians be counted as citizens of the Indian Nation, can they have the rights and privileges, voting and such? So now what we do know is Polly Johnson’s father was Thursday and her mother Elsie Doyle and her cousin is Sally Roberts with a younger cousin Sid Kernel! Not bad for a phone call on a hot afternoon! There is much more to this story, please follow me and get my updates. Mvto (Thank you) for reading my Latest News!